Start with Chalean Extream Challenge Pack Today! ChaLEAN Extreme is a body-sculpting program designed to help you lose up to 60 percent of your body fat in just three months, and see visible results every 30 days. It uses resistance training to increase lean muscle mass, which has been proven to burn calories and raise your metabolism. The result is a lean, firm, well-toned physique. Because Muscle Burns Fat—when you develop lean muscle, you raise your body’s metabolism, so you’ll burn more fat when you’re working out and even when you’re not. With Chalene Johnson’s Lean Phasing® technique, you advance through 3 phases of training, so even those without experience doing resistance exercise can achieve a lean, hard physique. And breakdown sets allow you to push past failure, stimulating more fat- burning lean muscle with every workout. One of the most popular fitness instructors in the country, Chalene is an experienced, highly motivating workout leader. With her guidance, you’ll learn the proper form and technique for working out with weights or bands, even if you’ve never done resistance training before. She’ll keep you from getting bored and inspire you to do your very best. What makes ChaLEAN Extreme unique? Cardio-only workouts burn calories while you’re exercising. But ChaLEAN Extreme incorporates resistance training to build lean muscle, so you burn more fat during each workout and supercharge your metabolism throughout the day. 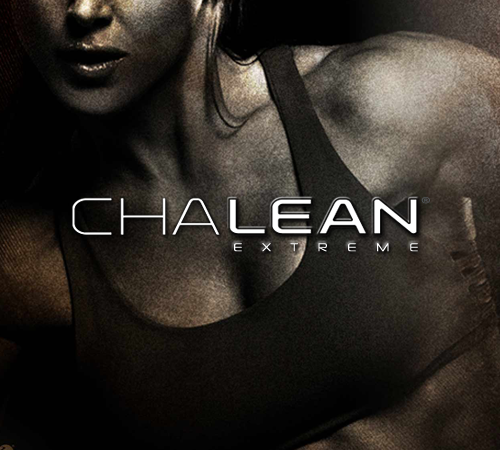 While gym-based resistance-training workouts often focus on building large muscles, ChaLEAN Extreme gives women a lean, strong, well-defined body, not a big, bulky physique. How does Chalene’s Lean Phasing technique work? Phase 1: BURN Start lifting weights to jump-start your metabolism. Phase 2: PUSH Learn how to lift heavy to build the muscle and burn more fat. Phase 3: LEAN Once you’ve built a foundation, Chalene brings it home with new routines and dynamic moves that melt the fat away. Extreme cardio: Chalene ignites your metabolism further with super-intense cardio and strength-training routines, then rejuvenates and lengthens your muscles with an invigorating flexibility workout. Core power: Targeted ab routines let you tighten and tone your abs for a rock-hard midsection.